Kim and Reggie Harris are two singers, songwriters, storytellers, educators, historical interpreters and cultural advocates. 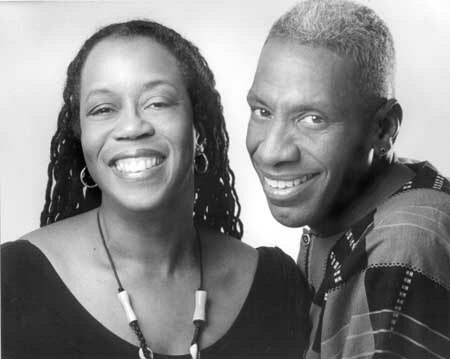 Born in Philadelphia, Pennsylvania, a city rich in musical and cultural heritage, Kim and Reggie were exposed to range of composers and musical genres. It was the start of what has evolved into the ” Bach to Rock” musical approach (with the strongest elements being Folk, Gospel and Jazz). They met, by chance, at a summer camp in 1974. While attending Temple University they honed their performance skills in the clubs and coffeehouses around Philadelphia. In 1980, Kim and Reggie toured universities, art centers, schools and other concert venues. They average over 275 performances each year. They have featured in performance at the Kennedy Center, the Smithsonian Institution, The International Children’s Festival in Canada, The Wang Center, The Pike’s Peak Center, festivals in the U.S, Canada and Italy and a host of universities, schools, churches and performing venues. Kim and Reggie are presenters in the John F. Kennedy Center for the Performing Arts Touring workshop program providing teacher training and arts events that encourage the use of the arts in the classroom. They have released five CDs on the Appleseed Recordings label, and one on the Folk Era label. They reside in upstate New York.